MRI Tech Salary - An article containing tons of information about the salary of an MRI technologist. 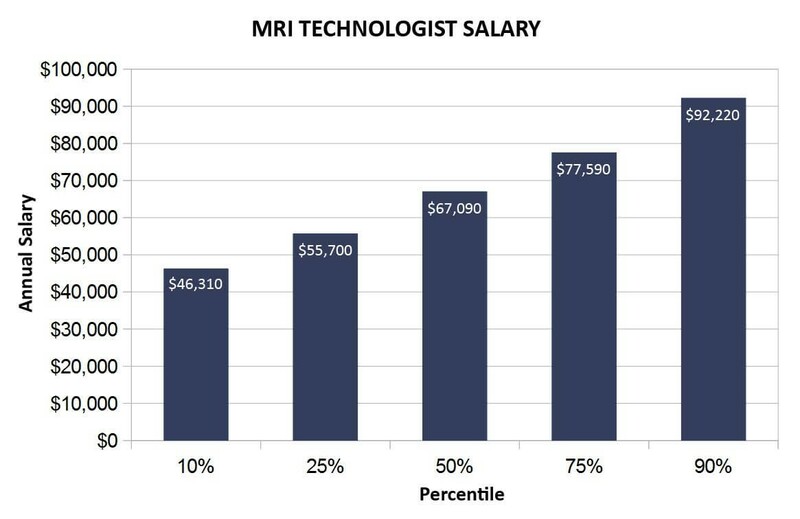 ﻿﻿Are you curious how much money an MRI technologist makes? Well if you are planning on starting a career as an MRI technologist, it is a good idea to first become familiar with the type of MRI job salary that is currently being offered. Doing so will not only give you a better idea of what to expect when you start your career, but will also give you an idea of what level of pay to negotiate when discussing your MRI technologist salary with a potential employer. While the MRI job salary numbers provided in this article are not necessarily inclusive of the starting salary in this field (and there may be some payscale variablity from one source to the next), the information that you discovery can help you develop a better understanding of the pay that you can expect while working as a MRI technologist. Below, you will find a few reputable online resources, as well as the MRI salary statistics that each online resource has compiled. It is extremely important to become informed about the payscale that correlates to current jobs in the field of magnetic resonance imaging, and to know what numbers you can expect with a career in this field! BLS.gov : MRI Tech Salary﻿ - The Bureau of Labor Statistics (BLS) is the principal fact-finding agency for the Federal Government in the broad field of labor economics and statistics. The BLS is an independent national statistical agency that collects, processes, analyzes, and disseminates essential statistical data to the American public, the U.S. Congress, other Federal agencies, State and local governments, business, and labor. The BLS also serves as a statistical resource to the Department of Labor. Salary.com : MRI Tech Salary - This website provides employee compensation data, software, and services to enterprises, small businesses, and individuals. The Salary.com website is one of the most widely recognized destinations for those seeking reliable information about employee pay levels and compensation-related best practices, trends, and policies. Payscale.com : MRI Tech Salary - This is an online salary, benefits and compensation information website that was developed to help people obtain accurate real-time information on job market compensation. The service works via the Internet by enabling individual employees to submit their job profile and salary data, which is then compared to others. The company states that it is able to use the volume of information statistically to determine accurate real-time salary information. 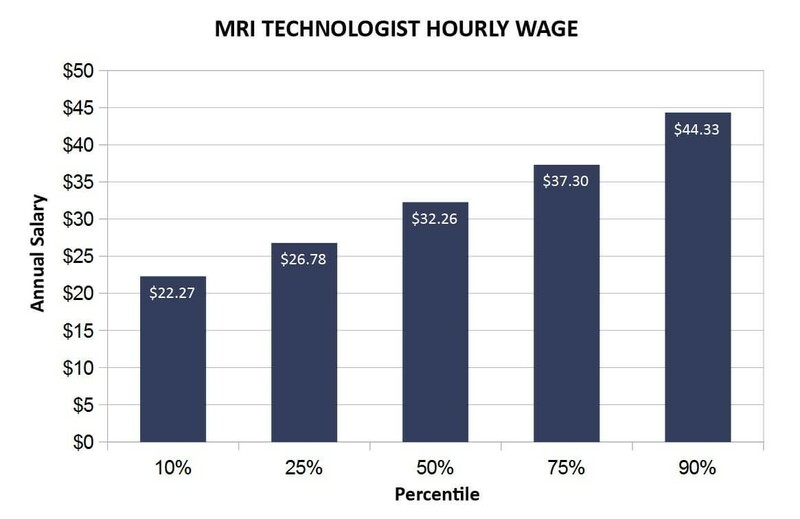 According to the United States Department of Labor - Bureau of Labor Statistics﻿, the mean hourly wage for MRI technologists is $32.36, while the average annual MRI tech salary is $65,410. It is important to remember that salary varies from state to state and also depends upon other factors such as experience, education, certifications, and job demand. Within the graphs below you can see a brief overview displaying percentile averages of current hourly wages and annual salaries for MRI technologists within the United States of America. ﻿﻿The following list contains links to reputable salary research websites. Simply click a link to explore more information MRI technologist salary statistics. Remember that there will be some variance from one source to another. Make sure to apply search filters (ex. location, experience, education, certification) when applicable. Now that you have familiarized yourself with the salary that you can expect as an MRI technologist, why not learn some handy salary negotiation tips? In the video below, two individuals discuss some negotiation tips that you may find useful when negotiating your salary during future interviews. Some of the main topics covered are listed below.